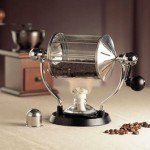 It may sound hard to believe, but up until the beginning of the twentieth century, it was still commonplace for people to roast their own coffee beans at home. Even fairly late on in the nineteenth century, people trying to sell ready roasted coffee beans had something of an uphill struggle on their hands. It was seen as something which everyone could do at home themselves in a good ol’ fashioned skillet or pan, but it had its difficulties. Thanks to the dubious invention of instant coffee, home roasting ceased to become quite so popular. The “pan” method never truly went out of style completely, but the results never quite got the consistency home brew fanatics craved. 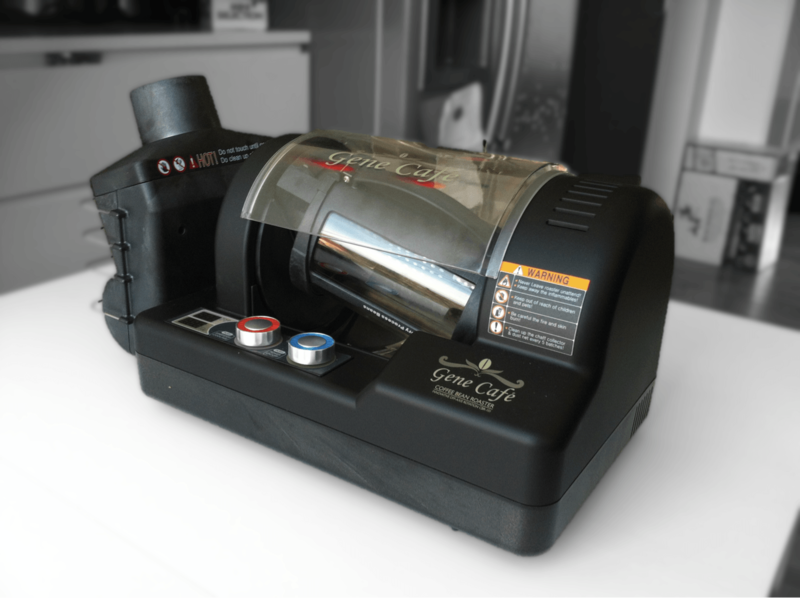 So, before we get into talking about the Gene Café CBR-101 Home Coffee Roaster (the subject of this article), we figure we may as show you how roasting the beans can be done – pan-style, if you so choose. 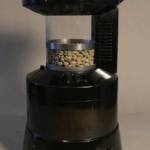 Other methods besides hot pans or skillets employed in the quest for home-roasted coffee bean goodness include the deftly used popcorn popper. However, it is generally accepted that these results will be somewhat lack-luster in the consistency department. Still, you can read our review of one of the more popular popcorn makers that can be used as a roaster here in this West Bend popper review. In the spirit of full disclosure we felt we needed to present you with some of the less expensive alternatives before we introduce you to the star of the show here. 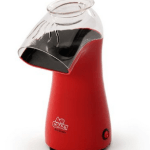 To be blunt, those other methods can’t hold a candle in terms of quality to having a real home coffee roaster like the Gene Café Coffee Roaster. 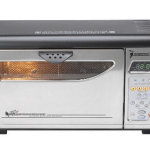 I’d say, if you want to get a home roaster that offers reliability, ease of use, value for money and, of course, quality of output, then this is definitely a device you should consider! Here below is a video which will show you the way around a Gene Café Home Coffee Roaster, and you will begin to see why it is worth getting. First impressions are pleasing of the boxing and general packaging quality. The diagrams in the manual are good, the translations from the Korean, less so. From an aesthetic point of view, this is a nice looking bit of kit, made largely of plastics and Pyrex. It is available in both black and red and makes one think of having a small steam locomotive in the kitchen, which is strangely quite fun. This roaster uses the hot air method of roasting, but there are elements of a steel drum, as the surfaces are also used as a method of heat. 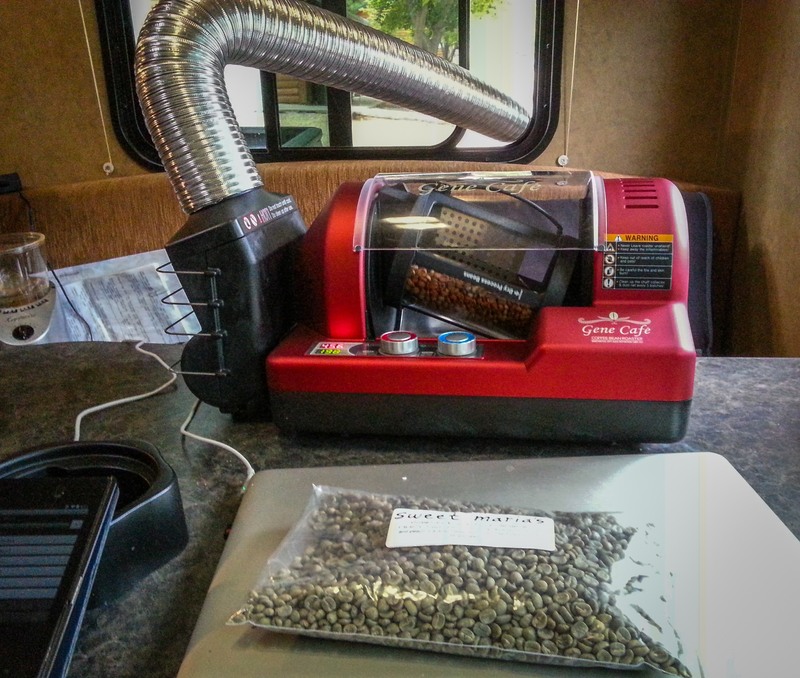 Take a look at the below video to watch a demo of the Gene Café Home Coffee Roaster. 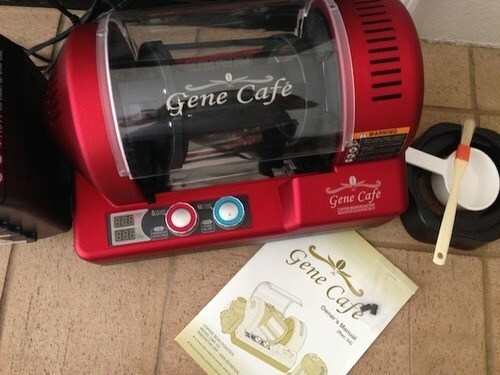 One of the things the Gene Café roaster scores highly for in this review is the fact it goes from out of the box, to up and running, in a relatively small timescale and with a minimum of fuss. The clear Pyrex top means that it is easy to watch the beans roasting, which is important as not all beans roast at the same speed. The chaff sorter on this machine also wins praise from its users as being a cut above some of the other models. However, in compiling this review it was brought to our attention that there are one or two slight areas of weakness with the design. For example, the rubber bumper on the outside of the drum will, over time, dry and crack. The led to some customers feeling it would be prudent to source a spare one in advance, to pre-empt its demise. Additionally, the hinge on the drum opener is rather fragile and would benefit from careful usage. 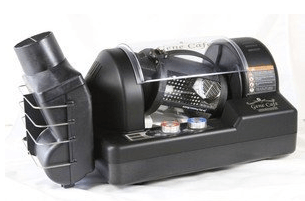 The bottom line is that no coffee roaster is infallible and any reading around the subject of home coffee roasters in general, these devices do not last forever and if you manage a few years out of one, you have done quite well. On the subject of noise, we can state that it is far from the noisiest roaster out there and although it does make some sound, you will still be able to listen out for the all important second “crack”. We think that the Gene Café Home Roaster lives up to its 4-Star reputation and does a commendable job of roasting coffee beans. If you’re looking to practice your roasting technique at home, you will quickly go from someone who might know very little about coffee to someone who will learn a lot very quickly. The other added benefit is that roasting this way and with this quality of home roaster is that you are there from the very outset of the coffee-making process. If you have never roasted coffee beans at home – a word of caution – no matter how you approach this, there will sometimes be smoke. Even though this unit is designed to try and minimize that, be prepared for this. Open doors and windows and turn on extractor fans. Possibly be ready to disable smoke alarms as well. Some people do choose to use these outside, although this may not be exactly what the instruction manuals advise. Also, never leave the roaster unattended. After a few minutes the beans turn yellow and give off a grass like smell. Then the beans begin to steam. When you smell the steam, then the first crack is imminent. The sugars are starting to caramelize and water will be forced out of the beans. The oils also start to move at this point. The City Roast: Depending on your taste buds and which sort of roast you are going for, the roasting may be complete now. The beans will expand in size now as caramelization continues. This is known as a City Plus roast. This is known as a full city roast or Vienna roast. Leaving the beans in for this length of time means a much darker roast, known as a French roast. Or, if you are not careful, charcoal! 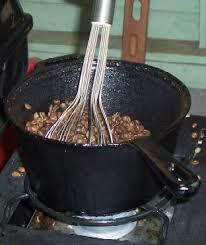 Allow the coffee beans to cool, then they may be placed in an airtight container or frozen. The perennial question of how long should coffee beans be kept for before they are ground, is one that divides many coffee lovers. It is all down to the bean type, the roast and of course, personal preference. Some people think they should be consumed within hours of the roasting, others say within a day, some think a week. The general rule is the fresher the better, but you’ll want to give your beans some time to de-gas as well. You say the fresher the better. Virtually everything i’ve read says that the beans should de-gas for at least a few hours. Most wait for a day or even two ! Yes You are right. De-gas it for at least four days is better.